The 2013 Urban Age conference took place in Rio de Janeiro on the 24th-25th October. The LSE Cities research team have spent recent months learning about Rio and the fascinating changes this city is undergoing. It’s a city right in the eye of the storm of current debates in urban studies, relating to poverty, urban regeneration, mega-events and informal housing. I summarise some of the conference research highlights in this post. For a more comprehensive picture you can download the conference newspaper here. Rio is defined by it’s mountainous topography. Here we look east with Zona Central on the left overlooking Guanabara Bay, and wealthy Zona Sul on the Atlantic Ocean to the right. 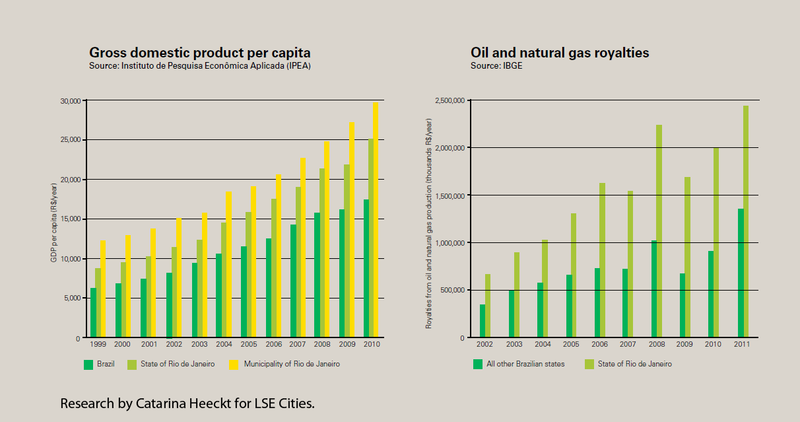 Photograph by Tuca Viera for LSE Cities. Rio conjures up very contrasting images to the outsider. On the one hand there is the wonderful exuberant city of Copacabana beach, samba music and carnival. These inspiring images are juxtaposed with the ongoing challenges Rio faces in terms of poverty, gang violence and drugs, captured in popular culture through films like City of God. Much more recently, Brazil has been hitting the headlines because of widespread protests across the country, with citizens demanding better quality public services and the tackling of government corruption. Brazil has in fact made admirable progress in social development in recent decades. Social welfare reforms, such as the Bolsa Familia pragramme introduced by former president Lula in 2003, have seen one of the world’s most dramatic reductions in poverty, with significant improvement in cities like Rio. Education rates have greatly increased, and the high number homicides that plagued Rio in the 1990’s has fallen significantly. These social improvements have been aided both by progressive leadership, and by a booming economy. The State of Rio has received a huge financial injection from the extensive oil and gas fields discovered off the coast. It makes for an incongruous sight walking along Copacabana beach to see the far horizon dotted with oil platforms. Revenues from this windfall have boosted investment into the city, although supporters of the current protests would argue that it should be more fairly distributed. 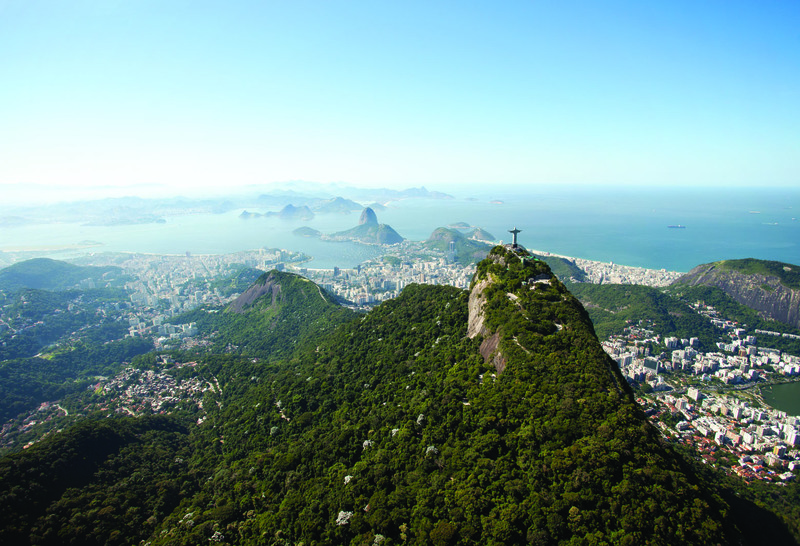 Rio has grown rapidly into a city of 6.4 million people and 12 million in the wider metropolitan region. It is both defined and constrained by its spectacular coastal topography of steep slopes, forests and lagoons. Much of the expansion in population in the 20th century was housed informally, and 20% of Rio’s population still live in the favelas. These were built on the less accessible steep forest slopes, leading to the common distinction between the ‘morro’ and ‘asphalto’, the informal and the formal city. This is often a fine-grained division, as favelas are spread across the entire city, visible from the richest to the poorest areas. Rather than demolish the favalas, Rio has worked to upgrade them with sanitation and electricity. Yet many remain isolated from public services and employment. The favelas have also been at the centre of drugs trade, controlled by gangs and armed militias. A high profile ‘pacification’ programme has been implemented over the last five years by the Rio government to reclaim these territories for the city. While this programme generally has public support, it involves serious use of force, with the army moving into favelas and disarming local gangs. After this initial disarming process, a network of police stations is set up and further efforts are made to made to reintegrate communities into the wider city, socially and economically. As seen in the above map, there is a distinct geography to the pacification programme, with favelas in the city centre and around the Olympic venues given priority. Rio will host both the World Cup in 2014 and Olympic Games in 2016, and these megaevents have greatly accelerated the pacification process. It remains to be seen whether pacification will eventually reach the entire city, or if peripheral favelas will remain beyond the control of city authorities. Rio’s topography and sharp social contrasts make for a largely fragmented city. Wealthy residents are concentrated in Zona Sul, the coastal area to the south that includes Copacabana and Ipanema. The magnificent beaches in Zona Sul are a central attraction for wealthier residents and tourists, and this area is expanding westwards along the coast to Barra da Tijuca, defined by high rises and gated communities that resemble Miami. The rest of the city is much poorer. 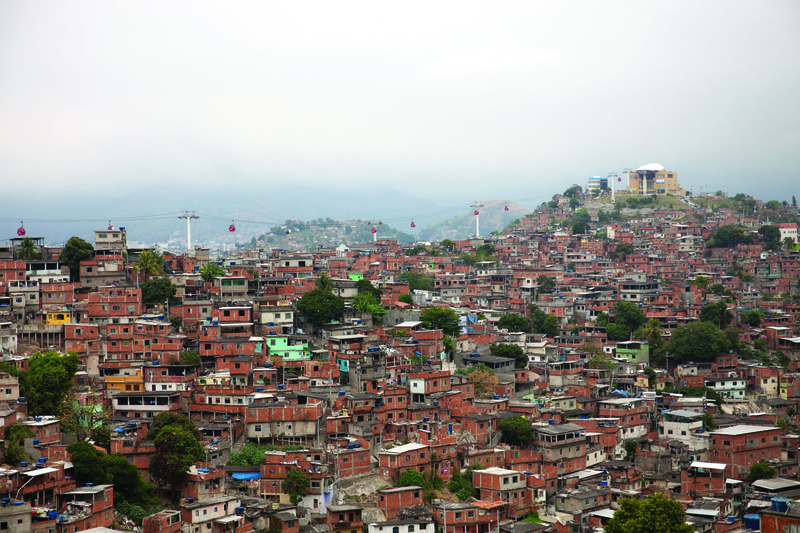 Residents in the periphery and isolated favelas can take hours to access services and work locations. This is exacerbated by Rio’s very limited public transport system, and the underdevelopment of the old city centre and port area. Concious of this fragmentation and the need for better connectivity, Rio’s authorities have begun a massive investment in public transport infrastructure. 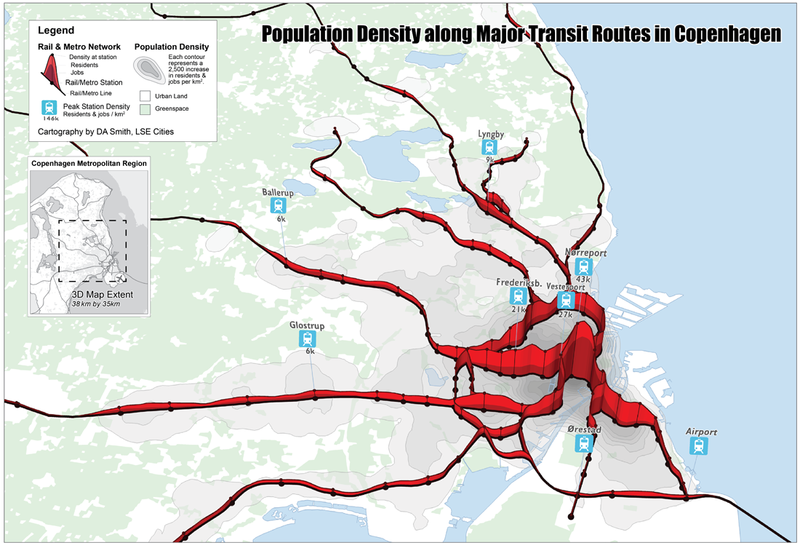 The centre-piece is a city-wide bus rapid transit system, with 160km of lines covering the entire width of the city area. The challenging topography of Rio requires serious infrastructure investment in tunnels and bridges to construct this new network. As can be seen in the above maps, the BRT routes have several aims. One is to make Barra da Tijuca a new transport hub, with the three lines converging near the location of the new Olympic Park. Another is to provide much better connections for the previously isolated western suburbs of Rio. And finally the TransCarioca line will improve links to the city centre. Arguably this latter point of better connectivity to the city centre should be a higher priority if Rio is to successfully revive its inner city. Olympic developments and real-estate interests are playing a significant role in this major public transport investment. See the Urban Age Conference website for full details of the research and essays by local and international experts on urban transformation. Videos of conference presentations and discussions will also be going online soon. There’s also a good summary of the discussion on the Rio Real Blog. World City Living and Working Densities: Poles Apart? 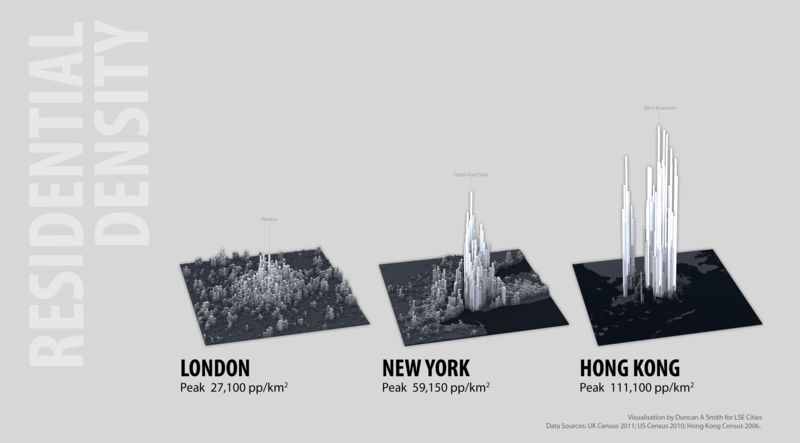 One of the most recognisable visualisation techniques used by LSE Cities in the Urban Age publications is the 3D density map- an intuitive and engaging way to represent built form, and enable comparison of very different city environments across the globe. I’ve been producing 3D density maps in my own research for around five years now, and so it was a nice challenge to produce the 3D density maps for this year’s Urban Age conference, the Electric City in London. 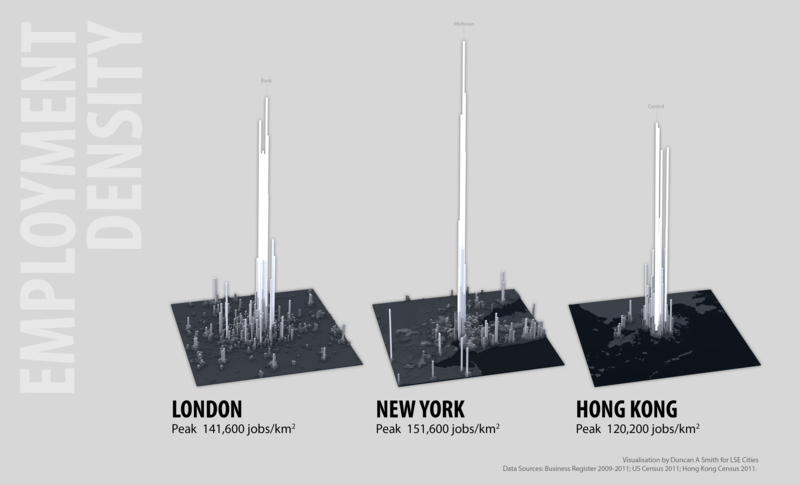 In this post I focus on the contrasting densities in three leading world cities- London, New York and Hong Kong- with the added twist that both residential and employment densities are mapped for comparison. Higher urban densities can facilitate more sustainable travel patterns, improve service delivery efficiency, reduce building energy use and promote urban vitality. These advantages depend of course on good urban planning to minimise congestion and pollution problems. High density mixed-use development is central to the compact city planning movement, and remains a foundation of sustainable planning policy today. Here we map the number of residents in each square kilometre of a 100 by 100 kilometre region for London, New York and Hong Kong. Lower urban densities apply to suburban-like neighbourhoods, while high densities generally represent medium or high rise buildings clustered on a tight urban grid. The city that stands out in the mapping is Hong Kong, with its extremely high residential densities exceeding 110,000 people per km2. Here planners have responded to scarce land availability with very tall (over 30 storeys) high-density development. Scarce land has also influenced the development of New York City, where Manhattan densities peak at 59,000 people per km2. London in comparison is much lower density. The heritage of suburban housing and generous greenspace has created a residential culture at half the density of New York and a quarter the density of Hong Kong. Despite current intensification in London, residential densities remain a world away from other global cities. Where people live is not however the only perspective needed to understand urban density. We can also examine employment densities for an important point of comparison (both residential and employment maps are at the same scale). Taller spikes in the employment maps represent higher numbers of jobs concentrated in business centres. London, New York and Hong Kong feature very intensive central employment clusters. The highest peak of over 150,000 jobs per km2 is in Midtown Manhattan. London is surprisingly close behind at over 140,000 jobs per km2, concentrated in the City of London and the West End. 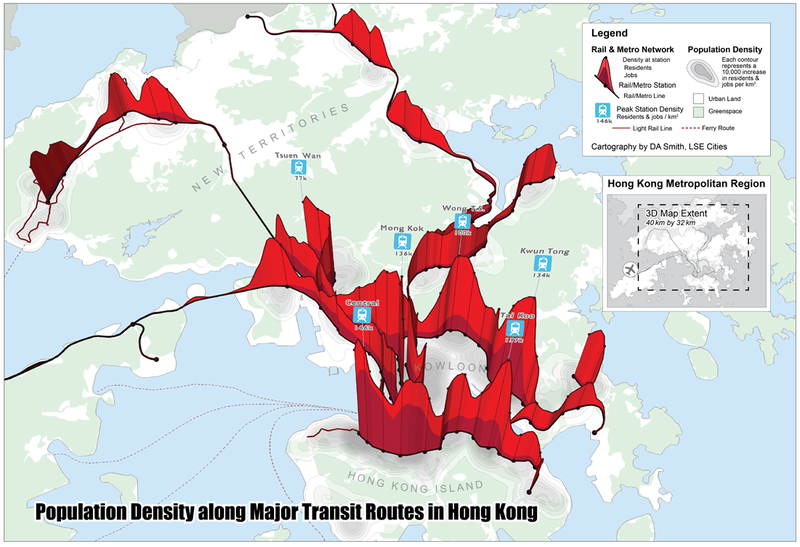 Hong Kong peaks at 120,000 jobs per km2 in Central (note the Hong Kong survey data is less comprehensive and may underestimate peak densities). These intense spikes represent very strong agglomeration economies, where financial and business services and creative industries cluster together to access labour markets, share fast-changing information and engage in face-to-face interaction with clients, customers and partners. Despite living in an age of instant telecommunication, proximity is still critical for many world city business activities. The extreme employment density peaks are indicative of economic success in these world cities. Demand for office space is so stong that developers get sufficient returns to build high and businesses use their space more intensively. Central employment clustering also means these cities are dominated by public transport rather than car travel (particularly Hong Kong). On the other hand the divergence of living and working densities can signify a lack of integration between living and working locations. London is very polarised between its low density living and high density working environments. This contributes to the long distance and long duration commuting travel for many Londoners (recent surveys find an average one-way commute times for Londoners of 38 minutes). New York has a better integration of living and working locations (average commutes are around 31 minutes). Hong Kong appears to have the closest integration of living and working spaces, though unfortunately commuting time survey data is not available to test this. The analysis here supports the medium-rise inner-city residential intensification that the London Plan prescribes to improve the balance of urban functions, and increase accessibility for residents and businesses. The gap in residential densities between London and many world cities is so large that modest intensification can be achieved while keeping London’s distinct character, providing development is on the much remaining brownfield land rather than London’s treasured greenspaces. Another interesting thought is whether the highly concentrated office clusters we see in London and New York will continue to be the way most businesses operate in the future. Greg Lindsay gave a good talk last week on how businesses are changing the way they use work space towards more shared and flexible environments that will likely be less space demanding. 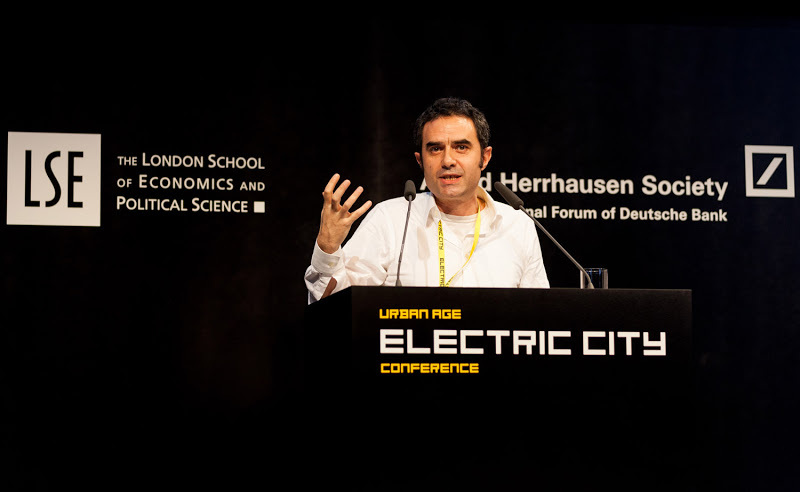 To see more detailed analysis of sustainability trends in many more world cities from the Urban Age conference see the Electric City conference newspaper. You know you’ve attended a good conference when the discussion leaves your head buzzing with new ideas and possibilities, and the debate continues long after the event closes. This was certainly the case at the Urban Age Electric City conference last week, where politicians, academics, designers and technologists met to share, discuss and argue urban policy and the future of cities. Ostensibly the conference theme was smart cities and urban technology, and there were several tech business speakers extolling the virtues of electric cars, smart grids and so on. There was however widespread cynicism of techno-fixes on many fronts. Adam Greenfield used the very definitions of the smart city provided by corporate promoters to show the vacuous techno-utopian branding of what is often simply an extension of the real-estate industry. Richard Sennett articulated the ambiguous and complex nature of traditional street-based urban form, and by extension how archetypal smart-city examples from Masdar and Songdu failed to create similar spaces of social interaction that support innovation. Yet it must be said that the urban technology debate is itself far more diverse than the strawman examples of Masdar and Songdu. Certainly the Shoreditch digital economy cluster that surrounds the conference venue illustrates thriving tech businesses in a traditional urban setting. Many of the counterexamples to smart-city utopia presented during the conference themselves involved aspects of technology, particularly in relation to communication and participation. Urban equity, or lack of, was a key theme for many speakers. Enrique Peñalosa, former mayor of Bogotá, passionately argued for tackling social inequality as a central element of improving urban sustainability- an argument he has helped translate into reality through reforming Bogotá’s public transport networks. The politics of inequality also underlie the social movements and protests that have rocked the world, from Occupy to the Arab Spring and the London riots. In these cases social networking technology presents a highly dynamic and unpredictable force that city governments, both rich and poor, are struggling to engage with. On the design front, the talk that best integrated the conference themes was from Alejandro Zaera-Polo, who sought to articulate the evolution of architectural style and practice in response to digital communication. Citing modular and self-build architecture examples, he described a new aesthetic of incompleteness, and used slum developments as the model of how complex functional urban form emerges from simple building blocks. 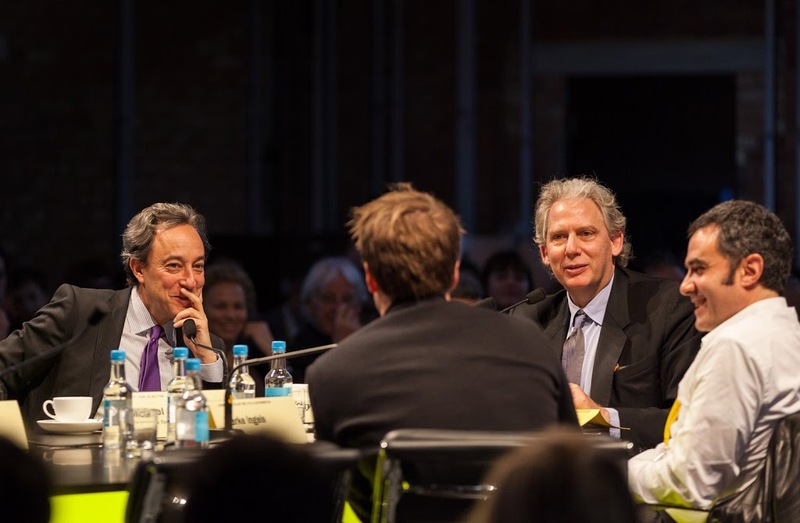 He also pointed to crowdsourcing as an increasingly key funding mechanism for development in the austerity age, requiring a new entrepreneurialism from architects to generate public support and money for ambitious projects. This spirit of architectural daring and entrepreneurialism was certainly on show from Bjarke Ingels, whose mad and wonderful “hedonistic sustainability” examples were a joy to see. Yet as much the designers inspired, presentations tackling the global environment highlighted the gaping chasm between urban sustainability aspirations and reality. “Cities dream of Barcelona and build Los Angeles” was Greg Clark’s quick-fire summary of Joan Clos’s conclusions from the UN Human Settlements Programme. “The compact city plus global lives do not equal sustainability” correctly argued Maartin Hajer. Intellectual heavyweight Anthony Giddens grappled with the grave implications of the 4+ degrees warming path we are set on for this century, and the high-risk high-opportunity civilisation we have created. When asked somewhat glibly by the chair whether he was an “optimist or a pessimist” he replied quite rightly that the question was irrelevant and that climate change requires scientific realism, a perspective that is currently beyond much of the public. It’s certainly appeared beyond the UK politicians on show, who enthusiastically banged the drum for sustainable London while conveniently forgetting that much of the globe’s fossil fuel industry in headquartered in London and funded by City banks. There were also some rays of hope for a deeper understanding of urban sustainability. The former mayor of Stockholm, Carl Cederschiöld, described how sustainability progress had been achieved in his city, pointing to the vital role of both strong national support and public understanding as well as city government. Dimitri Zenghelis put forward the economic growth case for an urban green transformation. Mark Swilling presented a methodology of understanding urban sustainability through social and resource flows- exactly the kind of approach needed for considering sustainability in an age of global connectivity. Maartin Hajer described the need for forging “coalitions of the willing” in tackling global sustainability where international governance has been so ineffective. And that’s what the Urban Age conference surely is in the end, one big coalition of the willing… or willing to discuss and debate at any rate. Thanks to all those who took part and contributed to a very engaging event. If you missed it, conference video highlights will be appearing on the website over the coming days, and you can read essays by many of these speakers in the conference newspaper. 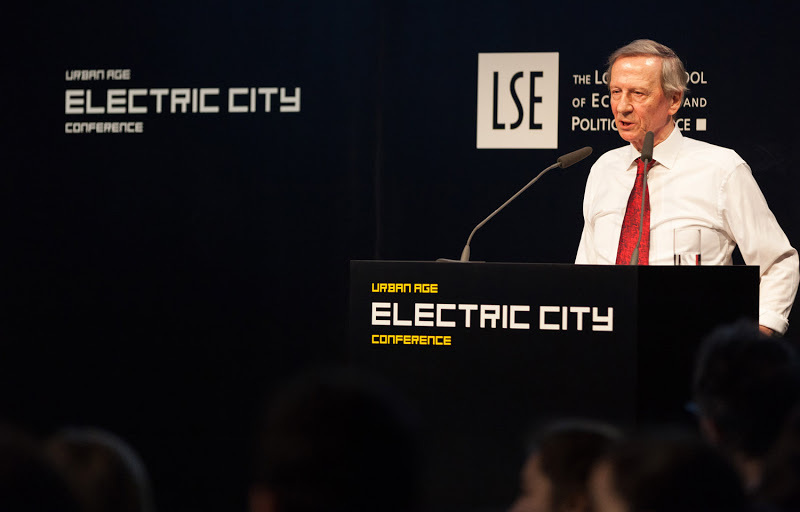 I recently began a new job at LSE Cities and have been working for the last month on materials for the Electric City conference in London, taking place on the 6th and 7th December this week. The conference will be exploring smart cities and disruptive urban tech from a sociological slant, and includes talks from famous urbanists such as Ed Glaeser, Saskia Sassen and Deyan Sudjic. You can get a flavour of the debate from Richard Sennett’s provocative article on “Stupefying Smart Cities”. The whole event will be live streamed on the conference website. My role, alongside the LSE Cities Research Team, has been in producing comparative urban visualisations and analysis around the theme of sustainable urbanism. These visuals and articles are now online in the conference newspaper.